Both the color of love and the timeless symbol of affection are proudly on display in this Garnet Diamond Heart Ring in 14K White Gold. By accenting a gleaming heart with splash of red sparkle and a dose of colorless dazzle, this ring provides an unmistakable means to communicate your adoration, as well as sweet, sophisticated and contemporary beauty. A polished, gracefully-curving heart crafted of 14K white gold is the centerpiece of this romantic ring, making this style a fitting way to convey a message of affection. Adorning the this bottom half of this symbol of affection are seven diamonds, small round channel-set gems that draw eyes to this sweet style with their colorless brilliance as they add to this ring's sparkling sophistication. 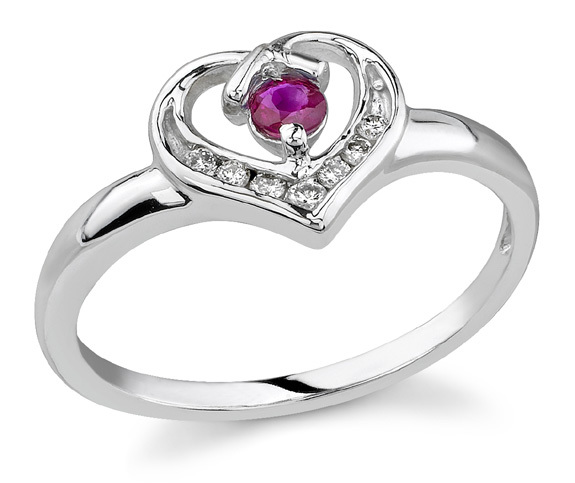 In the center of this gleaming, contemporary heart is a 3mm round garnet, 0.30 carats in weight. The saturated crimson hue of this semiprecious gemstone provides this ring with an affectionate and glamorous pop of color as it draws the eye to this romantic ring. The polished 14K white gold foundation that holds these gems is cool and classy, framing this sweet style with versatile shine. For declaring your love for the first time or celebrating a time-honored bond, this a perfect pick. We guarantee our 14K White Gold Garnet and Diamond White Gold Heart Ring to be high quality, authentic jewelry, as described above.